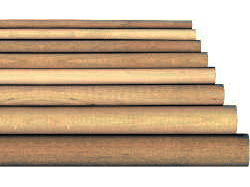 All Bear Woods Dowel Rods are kiln dried, clear, smooth, straight and accurately sized. Our eighth inch by thirty six inch doweling is made from high quality wood, and is North American made. North American made Dowel Rods are made with a higher quality and standard than those imported. 4) For longer length dowels, check out our Poplar dowels for five to twelve foot long dowels with one to two inch diameters.